I'm fairly sure that in endo-speak, I'm a dinosaur now. So just to get me out of that list and prevent Planet Botfu from turning into Planet Safari_Al (though yes, I am two months late with that), some random words. Requisite. Lucrative. Tantamount. Unintrusively. Flagrant. So if you happen to want to look at the images inside the iPhone, that is the bunch of PNGs no image viewer will shake a stick at, now you can. Just download my bit of code from svn://svn.poop.nl/pub/iphone-fixpng. Tested on OSX/Intel. There are instances where it will break, though you shouldn't run into those with images from the iPhone. You'll have to compile it yourself. Install libpng into /usr/local and type 'make' in a shell. Convert the PNGs into readable files by running fixpng input.png output.png. Then if you feel so inclined to make them pretty, you can flip the R and B channels around by running something along the lines of flipchannels input.png output.png. Update: Also tested using a PowerPC Mac, so the Makefile in svn compiles to Universal Binaries now. Ignorant as I am of the IMAP protocol (though I'm a native speaker of SMTP), it appears that there's a better way to tell your client to fetch new mail from the server: the IDLE command. And Michael Rothwell was nice enough to add it to Mail.app by way of this plugin. Essentially what it does on supporting mail servers is open up a second connection, select your INBOX and then just 'IDLE'. If new mail arrives in that mail box, the server will tell you about it. Quite a bit less elaborate than my applescript version, but so much more reliable. I'm sending in this post from FOSDEM, which means that my biggest complaint (actually, I think only complaint) for last year has been solved: the WiFi works! Bit of a weird implementation (lots of separate networks names instead of roaming) but I can see why they chose to do that: the broadcast traffic on a big roaming LAN with hundreds of laptops is enough to smother the average wifi connection. Of course last year's FOSDEM was powered by a couple (my guesstimate is about 3 or 4) Linksys WRT54Gs and their built-in antennae. This year I'm seeing professional towers with omni-antennas and an unidentifiable grey box that houses the actual access point. Buying two Wiis took me all of about 10 minutes. Part of those minutes were spent walking between three stores. Actually that's not entirely truthful. My friend Nadya and I had tried Wednesday afternoon at Schiphol after a store clerk said on the phone that they had Wiis in stock, only to return empty-handed and one of us somewhat depressed. I suppose trying to get one two days before the launch was pushing our luck. Skip to thursday, one day before the release. I'm buying a bluetooth headset in Haarlem to try out for a project at work, and on my way back to the bus I pass the Vroom en Dreesmann. I figure 'Hey, may as well try' and go inside. After asking the clerk if he had any Wiis he said 'yep', and opened the box he had received them in, which was right in front of him. He must have just gotten them himself. Unfortunately he could only sell me one of them as the rest were reserved. Better than none, I figure, so I buy it. Of course that still leaves one to find for Nadya, who would have been very very depressed if I had managed to find myself a Wii while she would have to wait. So I try Van Leest, the closest store that might have them. "We're getting them only this afternoon". Ok, crap. Next. Free Record Shop, 10 meters onwards (even though it's the one shop I never go to because they overcharge on CDs). They have four on display at the counter. I ask the clerk for one, he packs it up and I leave the store with a second Wii. No waiting lines involved, no pre-orders, no angry crowds trying to start a fight and no robbing of goods. I have m4d shopping sk1llz. Next I'll try my luck at getting some actual games. I'm ogling Wii Play at least, which appears to be fairly popular. This may or may not have something to do with the fact that it comes with a free Wiimote. Oh, and it's really fun to play with. The Wii may not stack up to the raw processing power of the PS3 and XBOX360, but the Wiimote makes it a lot more fun to play with. The PS3 and the 360 are pretty much the same as the previous models, except they can do better graphics and such. The same goes for the Sony PSP and Nintendo DS. (Though granted, I prefer the PSP). It's innovation versus brute force. In this case, innovation wins for me. 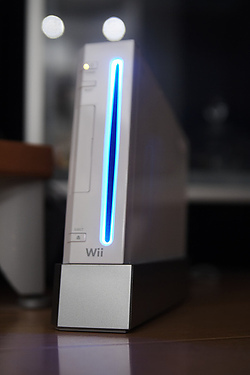 As a plus side to this lesser processing power: the Wii is much cheaper, at EUR 249,- here in .nl.